Stingrays got a bad reputation after the accident with Steve Irwin, but if you are careful, they are wonderful animals to photograph. I find that their eyes look a bit like goat’s eyes. In my years taking wildlife pictures, I have learnt a basic principle that works really well. If you let the animal come to you, it makes for a better encounter as the animal decides where it feels comfortable with your presence. 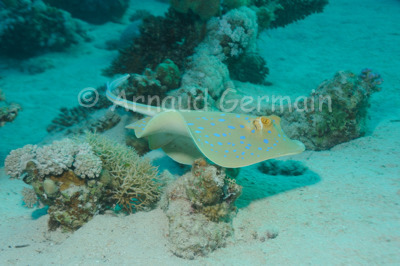 In this case, I stopped moving and the ray swam towards me and turned about one metre away from me. Nikon D700, Nikon 28-105 mm macro at 48mm, F8, 1/60th, ISO 400, Ikelite Housing and Ikelite DS160 strobe set on TTL. Marsa Shagra Bay, about 10 metres down, Marsa Alam, Egypt.